Estuardo Secaira for reviewing the text prior to publication. The Mayan culture, which probably emerged around 1500 B.C., made its mark on human history with an advanced civilization that stretched from Mexico’s Yucatan Peninsula to northwestern Honduras and El Salvador. The Maya built large city-states, developed sophisticated agricultural techniques, created a hieroglyphic writing system, and used their advanced mathematical and astronomical knowledge to develop a precise calendar system. Some of their greatest cities lay in El Petén, a lowland tropical region in the northernmost part of Guatemala, bordering Mexico and comprising one-third of the country’s territory. From A.D. 100 to 900 the cities of El Petén marked the height of Mayan civilization, distinguishing the region as the “hearth” of the Mayan culture. Overpopulation, which caused the region’s people to destroy their forests and deplete their soil and other resources, most likely brought about the collapse of the civilization in the 10th century. Most Maya moved to other regions, while some smaller communities remained in El Petén and survived until the Spanish conquest in the 16th and 17th centuries. Today, the population in El Petén is relatively sparse but growing rapidly. Since the 1960s, when the government opened a road into the region, the population has increased from 25,000 to more than 500,000 as people immigrated from elsewhere in the country. Only a small portion of the region’s inhabitants are direct descendants of the ancient Maya of El Petén, but many trace their ancestry to the Maya of other regions. After the collapse of the Mayan civilization, the forests returned to El Petén and enshrouded its abandoned cities. Today, it is a region of immense biodiversity. It provides habitat for at least 90 species of mammals and 400 bird species — including endangered animals such as the giant anteater, scarlet macaw and tapir — and its forests contain some 300 unique plant species. It is a part of the Maya Forest, the second-largest tract of tropical forest in the Americas after the Amazon (roughly the size of New Jersey), and contains Central America’s largest freshwater wetland. In 1990, at the behest of environmental groups and international lenders, the Guatemalan government established the Maya Biosphere Reserve as a means of preserving biodiversity while responding to human economic needs. Encompassing the northern half of the Petén, the 5 million-acre reserve is Central America’s largest protected area. It contains several national parks and biotopes, including Tikal National Park, surrounded by multiple-use areas that allow for the sustainable harvest of timber and other forest products such as allspice, xate (an ornamental palm frond used in floral arrangements) and chicle (a traditional chewing gum base). The area is also rich in cultural value, containing at least 175 ancient Mayan cities. Many have been excavated and studied, but many more remain cloaked in jungle. In the centuries since their civilization’s collapse, the Maya have continued to live and pass on their culture and spirituality. Currently, the United Nations estimates that 55 to 60 percent of Guatemala’s 16 million inhabitants are indigenous. According to Mayan spiritual leaders, 40 to 50 percent of the population practice some form of indigenous spiritual ritual, although perhaps only 10 percent do so openly in this predominantly Catholic country. Like other indigenous peoples, such as those of Peru (see Machu Picchu) and Australia (see Uluru), the Maya have a belief system rooted in a reverence for nature. They believe in a supreme creator whose spirit is present in all living things. Nature takes care of them — providing them with the means to farm, hunt and stay healthy — and they have a responsibility to care for nature in return. Mayan spirituality is expressed through rituals performed in natural settings and at ancient Mayan cities and temples. Despite colonial Spanish attempts to Christianize and exploit the native population, as well as more recent ethnic discrimination and injustice, the Maya have maintained a core of spiritual beliefs and practices passed down through oral tradition over the course of at least two millennia. The Maya of Guatemala today are struggling to recover from the country’s 36-year civil war, during which the Guatemalan military killed some 200,000 civilians, mostly indigenous, and destroyed hundreds of Mayan villages in an effort to repress an indigenous-based leftist insurgency. The 1996 peace accords that ended the civil war included the Agreement on Identity and Rights of Indigenous Peoples, which calls for recognition of indigenous identity and culture, protection of sacred sites, and unhindered access to those sites. A number of joint government-Maya commissions on sacred sites have been established to implement the requirements of the accords, but none have succeeded in reaching significant agreement or taking action. A key issue has been the insistence of Mayan representatives that an indigenous organization of spiritual leaders should have the sole right to manage ancient Mayan cities. While the government drags its feet on this issue, Mayan organizations are working to protect and foster Mayan cultural and spiritual identity, train priests and spiritual guides, and organize ritual events at sacred sites. Several ancient Maya cities in El Petén are considered sacred and have been reclaimed recently as sites of religious ceremony, including Tikal, where a permanent altar for Maya religious ceremony has been built. If these activities continue unchecked, Tikal National Park, which holds the largest excavated ancient Mayan city, is perhaps the only area of the Maya Biosphere Reserve equipped to survive. A 60-year-old national park, and a UNESCO natural and cultural World Heritage site since 1979, Tikal is a national symbol with well-established protection measures. Tikal was one of the greatest and most populated cities of the Mayan civilization, at its peak sustaining some 200,000 people within its 30 square miles, according to some scientists. Only 30 percent of the site’s area (about 6 square miles) has been mapped. A fraction of Tikal’s more than 3,000 buildings have been excavated, allowing visitors to see temples, palaces, tombs and religious monuments with hieroglyphic inscriptions. Following the 1996 peace accords, the Guatemalan government issued a decree designating six Mayan ceremonial sites within Tikal, granting spiritual guides access to those sites, and establishing guidelines for access and use that support indigenous rights while also protecting the park. Tikal is one of the best-staffed protected areas in Guatemala. It is also Guatemala’s number-one tourist destination, each year receiving an estimated 350,000 visitors who pay from $20 to enter the park. Even so, the national park is not without problems. Nearby settlements place pressure on the park as people burn forest areas for farming and cattle grazing, and others are illegally extracting non-timber forest products within the park itself. Increasing tourism has caused damage to the buildings at Tikal, disrupted the habitat of some animal and bird species, and created a garbage-management problem. A high turnover rate among park personnel also challenges management stability. 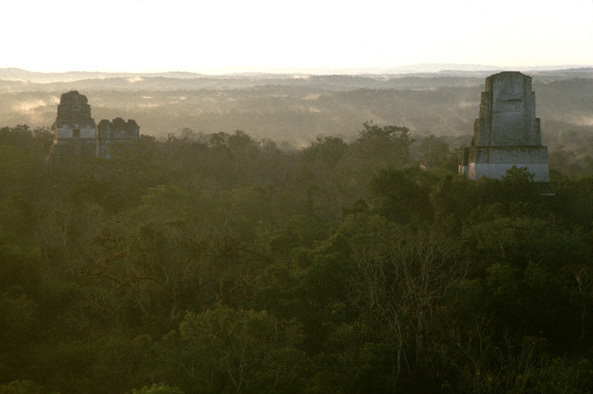 The Nature Conservancy assisted the Guatemalan Ministry of Culture in the development of a new master plan for Tikal National Park, replacing one created in the 1970s. As a part of the plan’s creation, Mayan spiritual leaders from the Committee of Sacred Sites were consulted and local communities offered a great deal of input. The plan places primary emphasis on protecting the natural and cultural heritage of Tikal and sets up a framework for sustainable tourism management. The plan advocates hiring from communities surrounding the park and building strong, mutually beneficial relationships with local communities. Meanwhile, as Maya throughout the country are reclaiming their cultural identity and fighting for equal rights, Tikal has become a political rallying point and a site of indigenous-rights awareness raising efforts. Guatemalan Maya Q’eqchi’ have turned October 12 — the day that recognizes Christopher Columbus’ “discovery” of America — into a day of Mayan ceremony at Tikal. This event has drawn as many as 8,000 people from throughout the country, making Oct. 12 one of Tikal’s most-visited days of the year. Just north of Tikal, the so-called Mirador Basin region is home to El Mirador, the largest ancient city of the Mayan world and the site of the two largest pyramids in the Americas. Twenty-five other sites have been identified in the basin, and there may be as many as 30 more waiting to be uncovered. There are no roads in the region and many sites are a two- or three-day hike from the nearest town. Excavation of El Mirador and other sites has begun only in recent decades, and because of the area’s remoteness, its primary visitors are archaeologists working to uncover its ruins and looters seeking its buried riches. The Mirador Basin, part national park and part multi-use area, is also a target for illegal forestry activities. In 2001, a UCLA archaeologist initiated “The Mirador Basin Project,” which aims to gain permanent archaeological and environmental protection for the region while spurring economic growth through ecotourism development. The project gained the support of part of the Guatemalan government, and in 2002, President Alfonso Portillo agreed to create the Regional System for the Special Protection of Cultural Heritage as a means of protecting archaeological sites within the Maya Biosphere Reserve. The president declared 600,000 acres of the reserve as a “special archaeological zone” and officially named it the Mirador Basin. Much to the dismay of some local communities, the agreement nullified concessions that allowed sustainable logging and forest-product extraction in areas near the archaeological sites. The Mirador Basin Project has gained considerable international support in the past decade, and it has the potential to transform El Mirador into the most-visited archaeological site and tourist attraction in Central America. The project aims to establish visitor centers and a park service team of rangers, administrators and law-enforcement personnel to provide nature, wildlife and archaeological conservation. It proposes a system of tourism lodges and hiking routes linking archaeological sites within Mirador Basin and trails that would also link to gateway communities to provide tourist services just outside the preserve. Supporters of the Mirador Basin project say it will integrate local communities into the wealth creation and development of sustainable tourism, which they say is far more lucrative than logging and slash-and-burn agriculture. Critics, however, say that communities could receive greater economic benefit from sustainable forestry than from working as maids and waiters in tourist hotels and restaurants. The community of Uaxactún, home to an ancient Mayan astronomical observatory, has managed a successful sustainable forestry operation for decades. Critics also question just how “eco” the project’s proposed tourism will be. Although the preserve itself will be roadless, new infrastructure would have to be built to bring tourists to the region. Experts say a highway in the Maya Biosphere Reserve would bring tremendous destruction through increased colonization and will provide easy access for illegal loggers and looters. Others criticize proposed plans to build two airstrips and a high-end wilderness lodge within the preserve, saying this would enable upscale tourists to fly in and out of the Mirador Basin without providing much financial benefit to the local communities. “Agreement on Identity and Rights of Indigenous Peoples.” Conciliation Resources. Buettner, Dan. “Groundbreaker; a plan to save Guatemala’s Mayan cities with a park and a posh eco-lodge has enviros and locals boiling.” Outside, August 2003. Call, Wendy. “Seeing the Forest, Not Just the Trees.” Terrain, Winter/Spring 2004. Global Heritage Fund. “Mirador, Guatemala.” Global Heritage Fund. ParksWatch. “Tikal National Park.” ParksWatch. ParksWatch. “El Mirador-Río Azul National Park.” ParksWatch. Secaira, Estuardo. “A Fruitful Dialog Between Protected Area Managers and Spiritual Guides: The Case of Chicabal Volcano and Lagoon in the Western Highlands of Guatemala.” Paper presented at the 5th World Parks Congress, Technical Sessions on Building Cultural Support for Protected Areas, Durban, South Africa, September 12, 2003. United Nations Educational, Scientific and Cultural Organization. “Maya Biosphere Reserve.” MAB Biosphere Reserves Directory. United Nations Educational, Scientific and Cultural Organization. “Tikal National Park.” UNESCO World Heritage List. U.S. Department of State. “Guatemala: International Religious Freedom Report 2003.” U.S. Department of State.